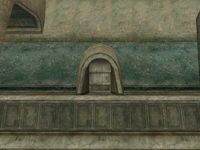 The St. Olms Waist South-One is the residence of Melvuli Hlaalu accessed from outside and located on the Waistworks level in the southern part of the St. Olms canton in Vivec. 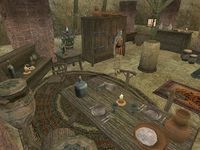 In the northwestern corner is a desk with a little chance of containing special loot, on top of which are three samples of ash yam, one sample of ash salts, and 35 gold coins. Next to the desk, on a small table, is a draggle-tail plant. There is also a small kwama egg in a bowl on the dining table and three urns containing cheap food in this area. In the northeastern corner is Melvuli's bed, with an exclusive restore agility potion on top of it. There is an iron spider dagger hidden under the pillow. Nearby is a closet containing random common clothing, an empty dresser, as well as two baskets that have a slight chance of containing special or marksman loot. On top of the dresser rest two bottles of shein, a bottle of mazte, and a common skirt. Next to it can be found a drum and a guarskin drum.